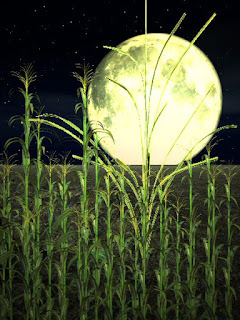 Green Corn Full Moon or Grain Full Moon is the 2nd moon after the Summer Solstice. We are in full swing of getting things ready for the harvest. We are harvesting some of our crops and seeing how good our intentions are and getting other crops ready to harvest. Not a lot of time yet to enjoy our bounty as we still have a lot to do - but we are starting to see what our hard work has given us. For me, I am enjoying my son's maturation and independence - my new career and being my authentic self. Coming up with more ideas for my practice and starting to feel better about the direction of my health. I am try to only look at this moment and near future and not obsess about the far future. Hopefully the harvest will be good. Oh and info on tonight's "blue moon"
Today I became closer to the ME that I want to be. I got my hair colored again and this time I went about 70% purple instead the about 15% last time. I LOVE IT! It FEELS like me. I am learning to just be what I want to be no matter what anyone else says. Something so simple and yet so hard. So today my son had all 4 wisdom teeth taken out which meant they put him under full anesthesia. He was so very fun to watch before and after his surgery. He was loopy and silly. So not only was he fun to watch, but I had a chance to really sit and talk to his wonderful girlfriend of over a year. And then I handed the torch over to her - she is going to take care of my baby boy who is all grown up. Such an interesting day.